A bit of pre-Baselworld 2014 news on this Speedy Tuesday! Although Omega already gave a few hints on their official Facebook page not too long ago (and enthusiasts immediately guessed it right), today came the announcement of the new Speedmaster Mark II (327.10.43.50) re-edition that Omega plans to introduce during Baselworld 2014. We are looking forward to it! As you can see, the new Speedmaster Mark II comes in two flavors, one with a racing dial and one with a white luminous dial. Just like the two versions that were introduced in 1969. In essence, the Mark II was a newer version of the famous Speedmaster Professional with its hand-wound caliber 861. The same movement, but with a more modern (for that time) looking case and a sort of integrated bracelet. Perhaps you remember the write-up on the original Speedmaster Mark II by – friend of the show – Ruckdee. You can find it here. 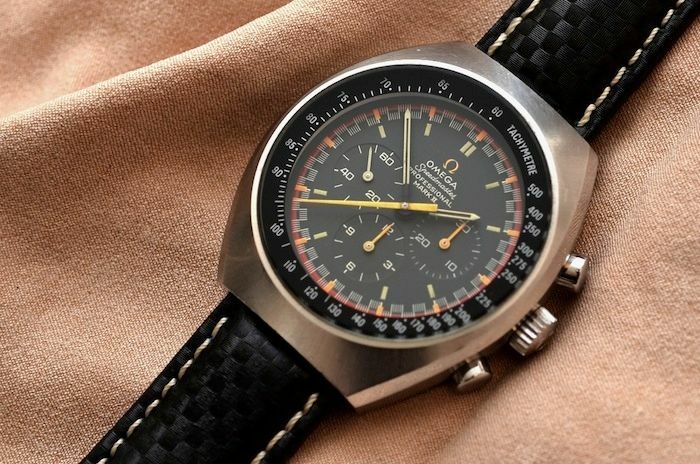 See the photo of the original Omega Speedmaster Mark II below, reference 145.014. As written before, the Mark series were in production parallel to the original Speedmaster Professional ‘Moonwatch’ and lasted till 1984 with the Mark V.
As you can see, the new 2014 Omega Speedmaster Mark II has the same cool finish on the case. A combination of polished facets and brushed surfaces on the case. What Omega really understood perfectly is the bracelet that belongs to this Speedmaster Mark II. From the first press photos, it seems to be very similar to the original bracelet that tapers nicely towards the clasp. Our guess is that the biggest ‘run’ will be on the Racing dial version. With its cool fluent orange chronograph hands and hour markers. We’ve seen racing dials on the Speedmaster Pro (145.012) from the 1960s as well as in the limited edition Speedmaster Professional for the Japanese market in 2004. We did a long-winded article on the different Speedmaster watches with Racing dials here. The 2014 Speedmaster Mark II has a fairly large case, 42.4 x 46.2 mm and comes with the Omega caliber 3330 self-winding movement. This chronograph movement is chronometer certified and is equipped with the Co-Axial escapement and silicon (Si14) balance spring. The new Speedy Mark II will have a luminous tachymeter scale that will be visible in low light. A novelty for the Speedmaster family. Except for the printing on the dial of the Co-Axial and Chronometer wording as well as the date aperture, it will be hard to identify whether it is an original Speedmaster Mark II or a re-edition. Omega has proofed in the past that they are very capable of creating cool re-editions (think PloProf). It has been whispered that this watch will be priced 4600 Euro (including VAT). Reference 327.10.43.50.06.001 for the Racing dial and reference 327.10.43.50.01.001 for the black dial version.